Demand attention and make a statement printing custom brochures and custom flyers. Printed flyers and brochures (also known as business pamphlets) are a cost-effective and a versatile marketing tool to help bring customer awareness to your business, service or products. Printed flyers are also ideal for promoting an event, concert or fundraiser. In addition to providing a large selection of sizes, we also offer a variety of folding options including Half Fold, Tri-Fold, Double Gate Fold and more. 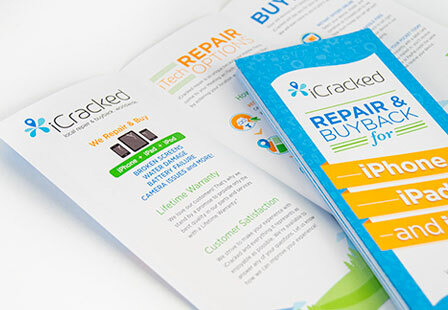 Whether using them as business brochures or event flyers, we can help get your message across! Please Select 3.67" x 8.5" 4" x 6" 4" x 8.5" 4" x 9" 4" x 11" 4.25" x 11" 4.25" x 12" 5.5" x 8.5" 5.5" x 17" 6.5" x 9" 7" x 8.5" 7.5" x 8.5" 8" x 9" 8" x 10" 8.5" x 11" 8.5" x 14" 9" x 12" 9" x 16" 11" x 17" 11.5" x 17.5" 12" x 18"